Anyone can learn to decorate their home but feng shui is a whole new territory. The chinese decorating techniques of feng shui can be mastered with ease and they’ll drastically improve the comfort of your home. Learning feng shui is also pretty simple given the right resources. And this in post I’ll share the absolute best books you can use to learn & master feng shui, even with no prior decorating knowledge. The ideas behind feng shui go beyond aesthetic to induce certain moods, feelings, and healthy habits. These books cover everything to drastically improve your decor and the feelings you have towards your living space. Feng shui expert Laura Benko learned a lot from studying the art of home decor. 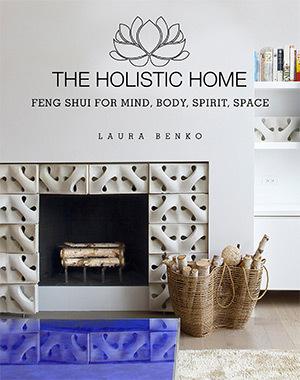 In her book The Holistic Home you’ll learn how feng shui decorating techniques can improve your mind and body along with the visual aesthetic of the room. The idea is to create a living space that revitalizes every part of your being. Rooms should represent order, sustainability, and overall wellness. When they’re improperly structured you can feel out of whack or just uneasy in certain spaces. With each chapter you’ll take a hard look at your home and the decor inside each room. You’ll need to consider how to arrange your home and which changes can make the biggest impact on the space. Everything is very straightforward and easy to read. Even a complete novice can work through these chapters and take away tremendous value. So if you’re on the fence about feng shui consider grabbing a copy of Laura’s book and see if her tips can improve your living space. Balance and harmony are two key proponents of feng shui. They’re also the main discussion points of this book which can turn you into a decorating pro. 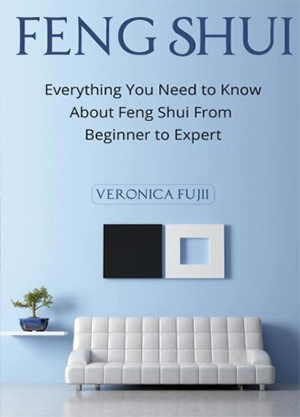 Everything You Need to Know About Feng Shui From Beginner to Expert is a great read covering the history and purpose of feng shui. You’ll learn how all the internal ideas tie together and how they interact to create a system of harmony and health in your life. Stress relief often comes from a decluttered life with more simplicity and purpose. Feng shui aims to solve the problems of stress in the home with a focus on the fundamentals practiced by interior decorators and spiritual gurus alike. You certainly don’t need a spiritual mindset to use feng shui. It’s merely an approach to life that aims to reduce negative feelings and increase more positive emotions. Some may shy away from this book due to its depth. However I do feel this book is an excellent read for beginners who want to see the “bigger picture” of feng shui. There’s a lot going on in the Chinese system of feng shui. It does relate to home decor but it’s also much deeper than that. Feng Shui That Makes Sense takes you through a full step-by-step guide to help you understand the nature of feng shui. You’ll learn how to apply basic principles to your home life that’ll make you and your family feel a lot more relaxed. But this system is also about pleasing the mind and the soul. 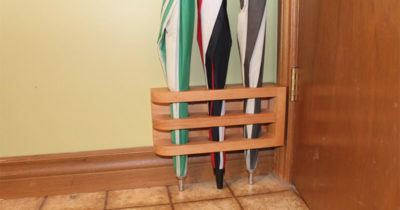 Your home will look aesthetically pleasing and function better. Harmony, health, and comfort are just some of the ideals to strive for with this decorating system. A good portion of this book concentrates on energies and feelings, many of which claim to stem from your home design style. But you’ll also pick up some pragmatic tips like redecorating with organic natural items in your home. Once you understand why your environment affects your lifestyle you can start to make changes. This book will get you there one step at a time with clear instructions and a laid-back writing style. The five elements are commonly used as metaphors for life: wood, fire, earth, metal, and water. The Chinese believe these elements represent ideas and can greatly influence the psyche. Decorating With the Five Elements of Feng Shui by Tisha Morris offers a deeper look into these five elements and how they can affect your home life. Tisha is a feng shui consultant helping to restyle hundreds of interiors over her career. 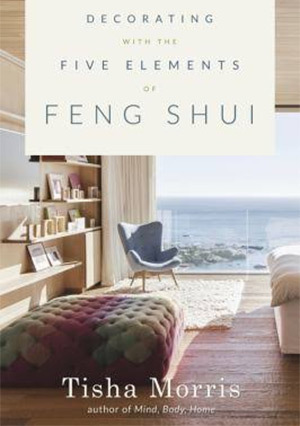 In this 260-page book she compiles all of her knowledge on these five elements of nature and how they apply to feng shui. You can work through your home room by room to spot any potential shortcomings or any opportunities you have to improve the space. Early chapters explain the basics of these elements, then as you work through the book you’ll understand how they all fit together. If you want to learn some real-world applications of these five elements then Tisha’s book is the only thing you’ll need. Redecorating is never free and it’s rarely cheap. 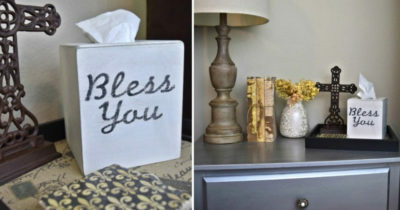 But if you know where to look and what to get you can restyle your living space on a slim budget. And that’s the goal of Feng Shui On A Dime which demystifies this ancient Chinese tradition. 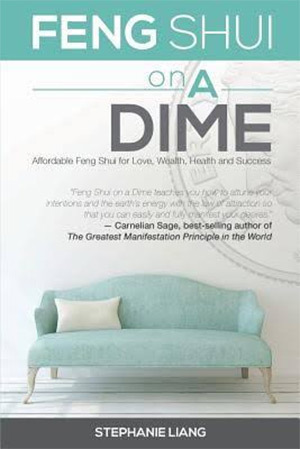 The book splits up into different sections based on feng shui goals: health, wealth, career, love, and family. Along the way you’ll learn to inspect each room of your house to understand how certain elements can affect your path in life. Furniture, decorations, spacious areas and even color choices all have a major impact. Plus each room has set purposes and you’ll want to consider those when redecorating. For example, most time spent in your home office is likely dedicated to work. Whereas time spent in your bedroom probably relates to health(sleep) or romance(marriage/partnership). You won’t find foolproof solutions to every problem in your life just by rearranging some furniture. But if you understand why your decorating style is so important you will see at least minor improvements in your moods and daily behaviors. Move Your Stuff, Change Your Life is the de-facto simpleton’s guide to feng shui. Even really intelligent people can get caught up in the complexities of this ancient Chinese philosophy. 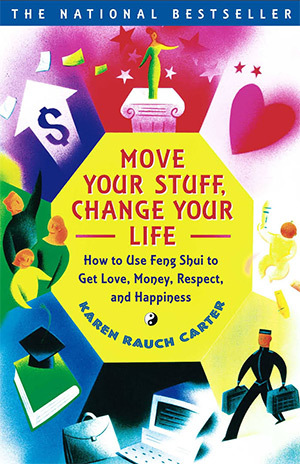 But in these pages author Karen Rauch Carter shares the best-kept secrets of feng shui in plain English. The concepts are laid down in simple terms where even skeptics might start believing. This was originally published in 2000 so it’s pushing two decades old. The good news is that ancient traditions rarely change, so this book is just as relevant as ever. In the first chapter you’ll learn about the feng shui toolbox and common terminology. From there you’ll dive into specific aspects of your life which can be improved through feng shui: money, career, reputation, and love are a few topics covered. This book is really easy to dive into and it’s actually a fun read. If you can get past the older publication date you’ll definitely enjoy the writing style. Everything in your house is a mirror of yourself and the way you live. This is how feng shui frames the idea of changing your space to ultimately change your mindset. 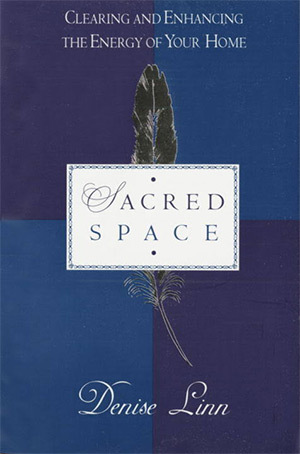 You can learn all about this by reading Sacred Space: Clearing and Enhancing the Energy of Your Home. Author Denise Linn has been speaking on these topics for over three decades and she’s an expert in feng shui design. 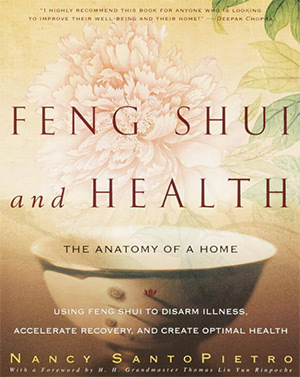 If you’re already on the fence about feng shui then this book is not for you. It dives into the spiritual and energetic aspects fast and hard. There is little room for skepticism but there’s plenty of room for critical thinking. Over the course of this 300 page guide you’ll learn how to diagnose problems by studying your home’s layout. Denise shares her personal experiences working with rooms that felt blocked up, where there was no space to move, or where sounds just didn’t reverberate harmoniously. Her book goes far into occult concepts like numerology and even into meditations or rituals you can perform to cleanse your house. These deeper topics are sure to put off some readers, while piquing curiosity in others. I’d only recommend this book for people with an open mind who want to consider all the possibilities(even in disagreement). With beautiful illustrations and tons of practical advice I have to recommend A Master Course in Feng-Shui for anyone serious about this decorating style. It’s a fairly large book and totals just over 300 pages long. Each chapter is full of visuals to help you understand the layout structures of typical rooms. These visuals also teach you good & bad examples of room styles so you can analyze your own living space. I do not recommend this book for complete newbies. It does have some decluttering tips but it’s not really a book on cleaning or home organization. Instead you’ll learn about the deeper meanings behind energy, geometry, and lifestyles as they play out in the home. Your living space can be affected by the tiniest addition of a new piece, or by the addition of a new living creature like a pet or a baby. After reading this book you’ll be a lot more sensitive to these changes and you’ll understand how to keep your home life balanced at equilibrium. For a dirt cheap and super short intro to feng shui consider grabbing a copy of Feng Shui For Beginners. This seems to be a lot cheaper on digital e-readers so digital is the better choice. This book is a pretty nice read but it’s definitely not a complete guide. It’s only 40 pages long and the content can be consumed by anyone. After reading through this book it’ll only whet your appetite for feng shui and nothing more. It’s a nice book for skeptics or anyone on the fence about this practice. But if you’re seriously ready to dig into feng shui you should start with a lengthier guide like Feng Shui That Makes Sense. Either way I want to include this book in the list because it really is great for beginners. 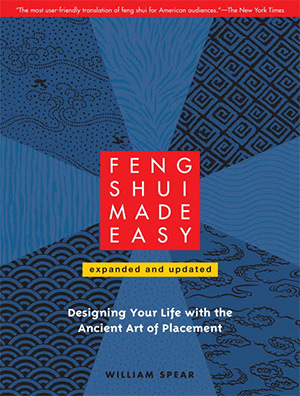 Feng Shui Made Easy was originally published in 1995 but got a major update in late 2010. 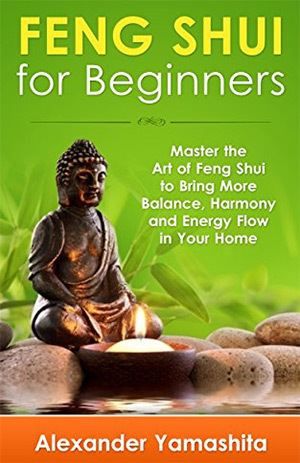 This newer version comes with so much more information and practical guides for homeowners who want to put feng shui techniques into practice. In the early chapters you’ll learn all about feng shui energies and how these can radically affect your home life. These invisible forces change based on the size, shape, location, and style of your home. Few people fully acknowledge how deep this topic really goes. But thankfully this book’s author William Spear is a well-known educator and consultant on the topic of feng shui for healing. His writing style is goal-oriented and leaves you with a series of paths to follow. There is never one single “correct” method of feng shui. Instead you’ll learn the principles and how to apply them to your home. If you want a book that’ll get deep into the practice of feng shui then definitely pick this up. The intro chapters can feel a bit slow but you’ll quickly get to the action with professional guides and decorating strategies. We spend so much time at home and never think how much that environment plays a toll on our psyche. Feng Shui And Health forces you to look at your living situation and consider how it could be harming your physical & mental health. 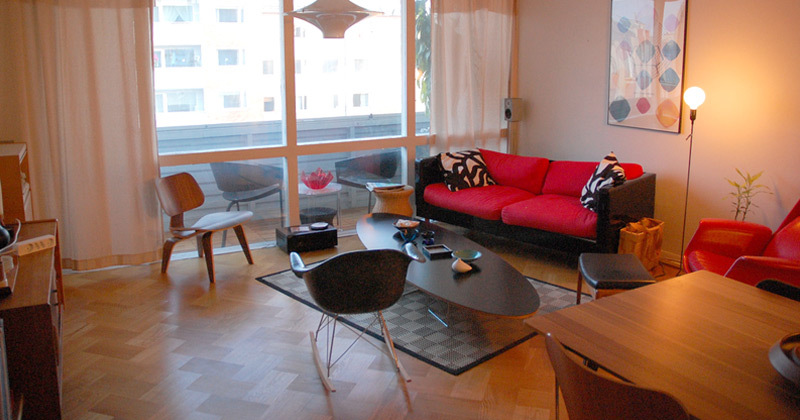 Certain furniture placements can build consistent patterns that make our lifestyles abysmal. For example, leaving a chair too close to the door so you always need to flinch or squeeze by to get through. Over time these repeated actions become subconscious but they can also deteriorate the way we carry ourselves. The information in this book aims to change those behaviors while correcting internal illnesses you may have developed over time. A total of 20 common illnesses are discussed in detail along with tips on how to diagnose others. Keep in mind this is not a medical book. It’s not about helping you cure your cold or remove a legion from your skin. Instead it’s a way of reprogramming your psyche and your behaviors to produce better outcomes, all through the seemingly magical practice of feng shui. In this massive 400+ page compendium you’ll find diagrams, live examples, illustrations, and tips you can apply to any room in the house. 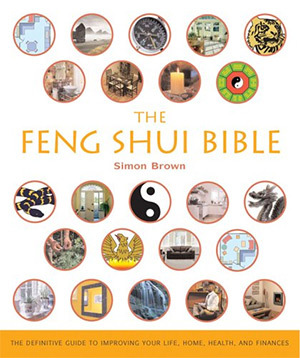 I absolutely recommend The Feng Shui Bible to anyone serious about this craft. It’s a book you can keep on your bookshelf and frequently reference whenever you have decorating questions. The author Simon Brown works as a feng shui teacher and consultant. He’s worked for major corporations like British Airways along with celebrities like Boy George. Simon has left a big impact on all his clients and hopefully he can help you too. He drops all his knowledge into this book and it covers a lot of ground. From the many color systems to the eight directions system, you’ll learn absolutely everything you need to redecorate your home for greater harmony. With so much information I do think this book can be overwhelming for beginners. So keep this on standby until you’ve consumed some beginner material and want to get deeper. The coolest thing about this book is how it goes into much greater detail on certain topics. Mirrors, materials, and seated furniture are just a few examples that Feng Shui Your Life cracks open and covers with a fine tooth comb. 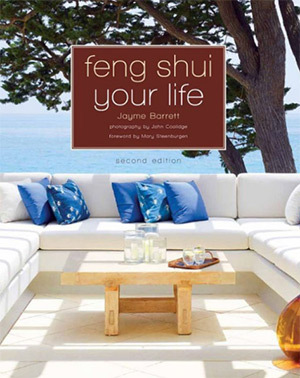 Author Jayme Barrett is an expert speaker and consultant in the feng shui world. Her writing style flirts on the line of pragmaticism mixed with spiritual concepts. But the best part about this whole book is the action-based writing. If you’re willing to put these ideas into action you can test for yourself if feng shui makes a difference or not. Her newest updated edition of this book covers more about technology and how our tech-saturated world needs more balancing at home. If every room in your house has a digital screen then it’s easy to feel overwhelmed and even lonely. Early chapters start slow educating beginners on the fundamentals of feng shui and how it all works. You’ll quickly move into decorating advice for each room and making a Bagua map for your home. These tips really can make a difference in your living situation and the best way to see how they work is to grab this book and put Jayme’s advice into action. I wouldn’t call this a strict how-to guide but I do think it’s a book that belongs on your bookshelf. 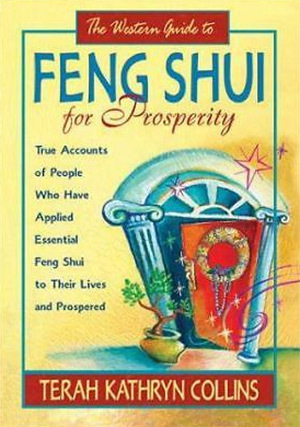 The Western Guide to Feng Shui for Prosperity shares true accounts of people who have applied feng shui into their lives and seen dramatic improvements. 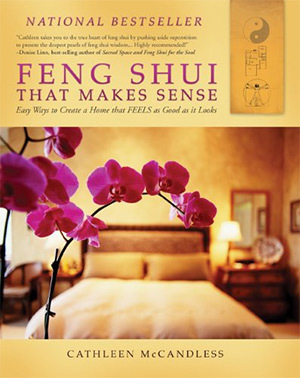 Anyone skeptical of feng shui really should grab a copy of this book. If nothing else it’s a cool look into the lives of others and how they chose to redecorate their homes. Whether you think feng shui can actually improve creativity, or whether you think it’s a placebo effect, these stories are real and they’re perfect for western audiences. 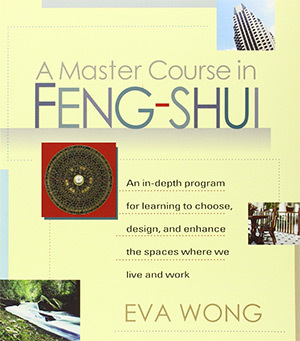 You probably won’t learn a whole lot about feng shui just by reading this book. It’s also not the right book to read if you’re planning to redecorate. Yet it is a fun read for all ages and all backgrounds regardless of your beliefs. The writing style explains feng shui in a way that can make sense to westerners and hopefully leaves a lasting impression on the reader. Now with so many books in this post it can be tough knowing where to start. Honestly every book in this list is amazing and chock-full of great info! But if you’re brand new and want a solid overview I suggest Feng Shui That Makes Sense. This is great but much more philosophic, so if you also want a practical “take action” type of book I also recommend Feng Shui On A Dime. You really cannot go wrong with any of these titles. No matter what you’re trying to learn or how much you know about feng shui there’s bound to be something here for you.